The infinity pool with mosaics which is irregularly shaped and curved, was designed by the artist Ugo Nespolo, thanks to the insistence of art critic Richard Zelatore. It was made by skilled Italian art pottery artisans and has underwater lighting. It’s 1,50 m deep, 50 cm deep in the children’s area, and is supervised by an attentive lifeguard. 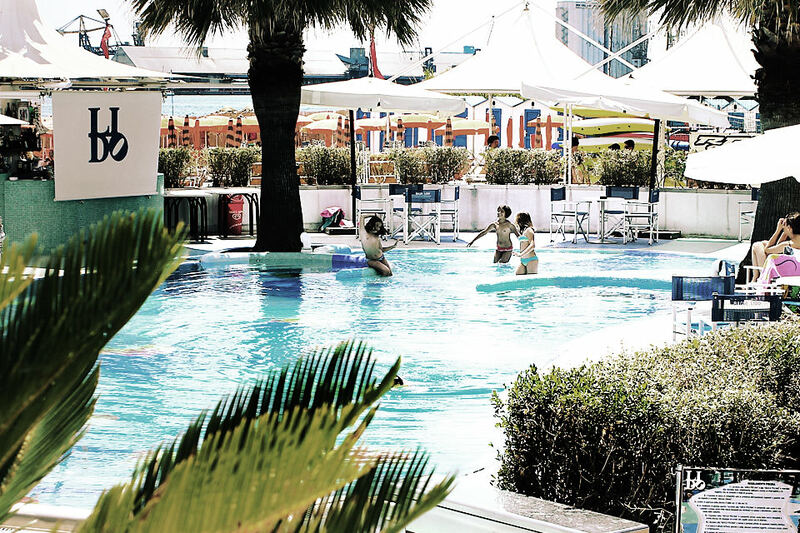 Let yourself be pampered in the shade of our palm trees: the pool is equipped with two comfortable Jacuzzi. The water is filtered 24h a day and the temperature, between 26° and 30°, chlorine and PH, are kept under rigorous control to guarantee cleanliness, hygiene and safety. opening dates from 1 June to 15 September: 8 a.m. to 8 p.m.
Lifeguard hours: 10 a.m. to 7 p.m.
Access is guaranteed for those with disabilities and is close to the 220 equipped cabins and 5 toilets. Fig.1 — A work of art signed by Ugo Nespolo for our swimming pool. Relax in the ample solarium by the pool with sun loungers, chairs, tables and sofas. 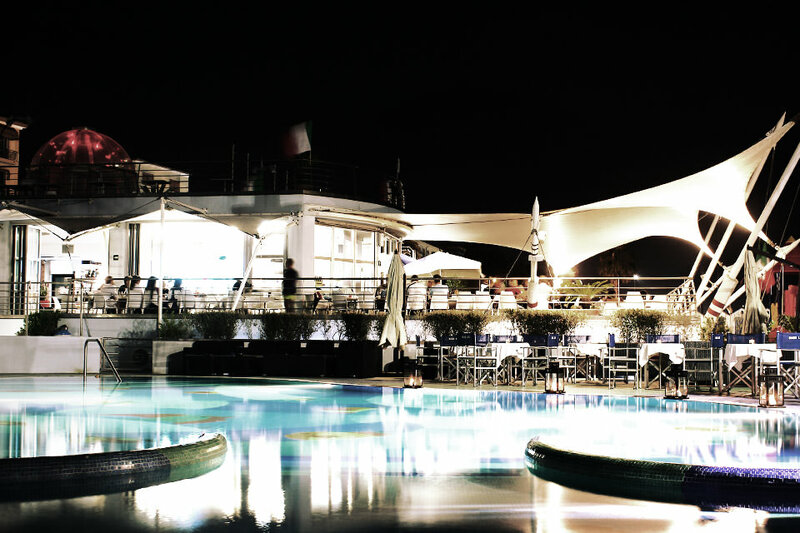 Enjoy refreshing drinks and have aperitifs with entertainment and DJ in our pool bar. The ideal venue for organizing your exclusive private event. Fig.2 — Organize your events by the Pool.